Chafer grubs are soil-dwelling larvae of chafer beetles. Depending on the species of chafer they either feed on decaying plant material or plant roots. Evidence of their activities can be seen in a number of ways. Between autumn and spring the damage is most noticeable, as grubs are at this point reaching maturing. You may notice yellow patches on your lawn, and you may see secondary signs of damage from birds, badgers and foxes, who tear up the turf in feed on the grubs beneath. Nemasys Chafer Grub Killer is a safe and effective way to deal with a chafer grub infestation, which can only be treated using biological methods. 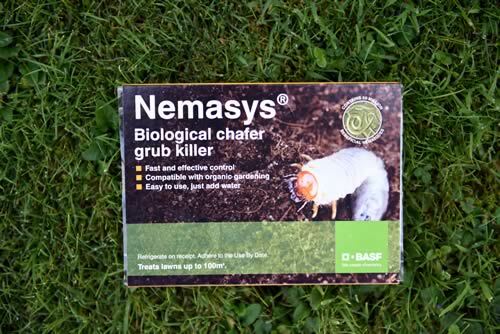 So, what is Nemasys Chafer Grub Killer? Nemasys Chafer Grub Killer is a natural product containing microscopic worms (nematodes) which seek out and kill chafer grubs, but is still safe to use around children, pets and wildlife. Nematodes attack the pest by entering natural body openings, releasing a bacteria which quickly and safely kills it. The nematodes then reproduce inside the dead pest and release a new generation of hungry nematodes, which disperse and search for further prey. Apply nematodes August to October, before the soil gets too cold and when the young grub larvae are active. Mix the Nemasys with water (following the pack instruction) and apply immediately using a watering can or hose, to already moist lawns, when the soil temperature is above 12 degrees centigrade. Straight after application, water the grass well so that the nematodes are washed into the soil where the chafer grubs will be. Keep the lawn well-watered for at least two weeks after application.